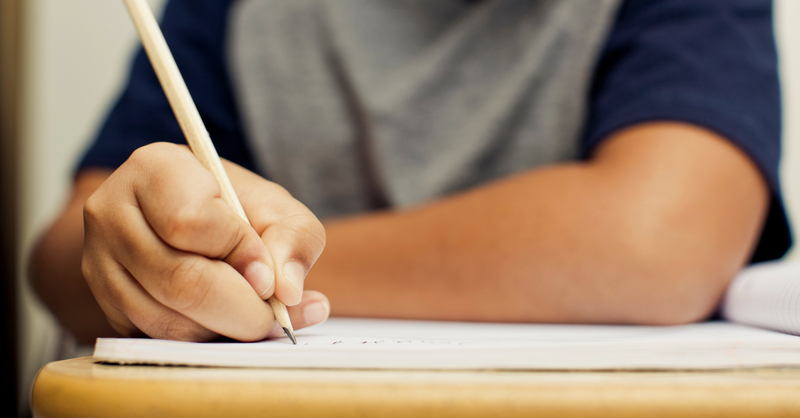 Convergence insufficiency (CI) can significantly handicap ones ability to read and learn. Symptoms often include difficulty reading and concentrating on reading tasks, avoidance of near work, ADD and ADHD characteristics, double-vision (overlapping words) while reading, eyestrain, headaches and rubbing or closing of one eye while reading. Below, one parent explains her son’s vision therapy journey. After years of problems at school, from not being able to form letters legibly to everyday stomach aches and resistance to attending, and constantly getting in trouble for not completing work, Nasim began to become defiant towards teachers and depressed about disappointing his parents and teachers. “I don’t know why I can’t do this” was his constant, frustrated refrain. One day, his school’s dean said, “Nasim might not be able to meet our high standards, maybe you should consider another school.” But we knew Nasim was fully capable of meeting any standards set for him. The summer of his 12th birthday, we spent days and thousands of dollars having evaluations and assessments done to figure out what was wrong. At the same time, we had him evaluated to start tutoring at Encourage Learning Institute, which teaches students with various disabilities and learning styles. At the end of that evaluation, a vision therapy consult was recommended. Within 5 minutes of meeting Dr. Bartolini, we discovered that Nasim had been seeing everything double for his entire life. It was a severe convergence insufficiency, and after learning about the condition, it was apparent that it was likely the source of all of Nasim’s years of difficulty at school. At age 12, Nasim realized it wasn’t normal to see everything double. Over the course of his vision therapy, we saw major changes in Nasim’s behavior and attitudes. He wanted to play ball during recess (previously he refused to play any sport involving a ball). He was able to complete school assignments and homework without tears and procrastination. Now Nasim comes home from school and excitedly talks about what he’s learned that day. 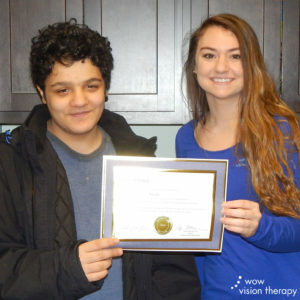 We still have lots of work to do – 12 years of behaviors resulting from school experiences don’t go away overnight, but this was a major handicap that has been effectively cured by Wow Vision Therapy, and for that, we will always be grateful. I look forward to many years of educating other parents and doctors about convergence insufficiency and how it affects kids’ learning and recommending Wow Vision Therapy to anyone who will listen. Concerned you or your child may be struggling with a vision problem? Schedule an appointment today with one of our teams. Disclaimer: The patient, parent or guardian in this story has authorized the use and disclosure of the patient’s name, photographic/video images, diagnosis, prognosis, treatment plan, and/or patient testimonial.